How about Wendy for Lite Guv? Robert Miller makes a pretty good case. Governor General Abbott appears unbeatable by Democrat or Republican. 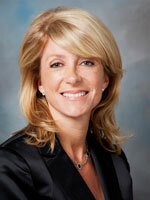 Sen. Davis, as a Harvard-trained lawyer, could run for the open office of Texas Attorney General. However, that does not appear to be a particularly exciting, nor necessarily winnable, down ballot matchup. The marquee matchup would be to run for Lieutenant Governor, who serves as Presiding Officer of the Texas Senate. A fierce contest has commenced for the Republican nomination, with Lt. Gov. David Dewhurst being challenged by Sen. Dan Patrick, Land Commissioner Jerry Patterson and Agriculture Commissioner Todd Staples. Polling shows that today Lt. Gov. Dewhurst is headed towards a Republican primary runoff. Harris County is the largest bloc of Republican voters in the state, and Sen. Patrick is well-known and very popular with these voters. The margins Sen. Patrick will roll up in Harris County arguably could give him a spot in the runoff. The purest of the pure partisans show up for primary runoffs, and those are more likely to be Sen. Patrick radio listeners (in Harris County) and voters. This would bring us a Davis vs. Patrick contest for Lt. Governor in November 2014, a stark contrast indeed. One of the most liberal senators vs. one of the most conservative; pro-choice vs. pro-life; woman vs. man; and, at this point, woman vs. a possibly all male Republican statewide slate. One mistake by Sen. Patrick and Sen. Davis has a shot. The irony is she would then preside over a Senate probably comprised of 20 Republicans and 11 Democrats – the Republicans would have an excellent opportunity to pick up Davis’ senate seat. All of the Lt. Governor’s powers are derived from the rules of the Senate, which are adopted by a simple majority vote (16 out of 31). Wouldn’t the Republicans simply strip her of these powers? My crystal ball gets cloudy that far out. But it wouldn’t matter from Davis’ perspective. If they stripped her of the traditional powers of the office, it would simply magnify her prominence and amplify her voice. My thinking has evolved. I now believe it makes political sense for Sen. Davis to run statewide for Lt. Governor in 2014. As she hits the newsstands in August, look for #Wendymania to continue trending. It should be noted that there’s probably as great a chance that the Senate would strip the Lite Guv of its traditional powers if Dan Patrick wins as there is if Davis wins. As we know, Patrick has made his share of enemies among his Republican colleagues. It wouldn’t take too many more to dislike or distrust him to make that a real possibility. Another thing to consider is that Davis would be much closer to parity with the Republican Lite Guv hopefuls on the fundraising end. She has over $1 million in the bank after her latest haul, all of which came in the last two weeks of June. Patrick has $2.1 million on hand, Jerry Patterson has $1.3 million, Todd Staples claims $3 million, and Dewhurst has $1.7 million, though of course he can write his own check. All of them will have to spend a chunk of their money in a sure-to-be-nasty-and-substance-free primary. One last thing: If Sen. Davis does run statewide, whether for Governor or Lt. Governor, the person I want to see run to succeed her in the Senate is the same person that succeeded her on Fort Worth City Council, and that’s Joel Burns. Holding her seat would indeed be very difficult, but Burns would be the kind of candidate that would inspire enthusiasm and generate fundraising. Who’s with me on this? It doesn’t so much matter what statewide office she runs for, it’s just important that she runs. She could be running for State Dog Catcher and be destined to lose, and still I think she should do it. We have millions of dems in this state who need their hopes raised, and if we lose, we lose, but I would love the fight. I think the dems in this state would love the fight. We can’t keep waiting for the “right” year. I should say that it is, of course, entirely her decision, and we should respect it, whatever it is. Anybody would be “unbeatable” without opposition. If nobody runs against them, how is anyone to know… whether or not they can be beat? So, we just concede this one, and move on? Isn’t that what got us in this mess? The Dems need to get off the fence and field candidates and finally show up. If not they will continue to be irrelevant in the state and have no voice. The state party leadership needs to be fired and bring in some new blood. Wendy has done more than excite the base, she has excited people who have been uninterested in Texas politics for a long time or never before. It’s a waste of momentum and energy to not put her at the top of the ticket, even if it’s potentially a suicide mission. People who are not your typical politicos were excited to see the Democratic party finally grow a backbone, I know that the advisors that be are already poo-pooing anything for 2014 and they’re probably right that victory will be elusive, but it’s a crucial building block for long term success. I’ve already heard rumblings that Boyd Richie should run– worst suggestion ever and way to kill any momentum. The big question right now is will the Democratic party ever learn and take cues from the grassroots base or will they just continue to keep it in the boys’ club. Of course, the choice is ultimately up to Sen. Davis, but lets hope her decision is her own and not the result of backroom strategizing by a bunch of guys who strategized us into this mess to begin with. I think this would be a smart move, but it depends on who chooses to run for Governor instead of Davis. The next choices IMO woukd be Kirk Watson or Marc Veasey. If Wendy Davis is still on the ticket, it would give a big boost to Democrats, but she’d also be protected for a future run at Governor or Senator. Texas has become an almost uniform straight ticket voting state. Without a close race for Governor or Senate the downballot races will be a fair accompli. if wendy davis runs for lt. gov. then julian castro could run as governor. cecile richards could run for u.s. senator. juaquin castro could run for att. general. kirk watson for comptroller. leticia van pute for railroad commissioner. john whitmire, rafael anchia, donna duke, and royce west make good candidates, also.